Three Pieces Forged Steel Ball Valve - Stainless Steel Pipe Fittings, Flanges, Valves,Maxbright Group Inc. 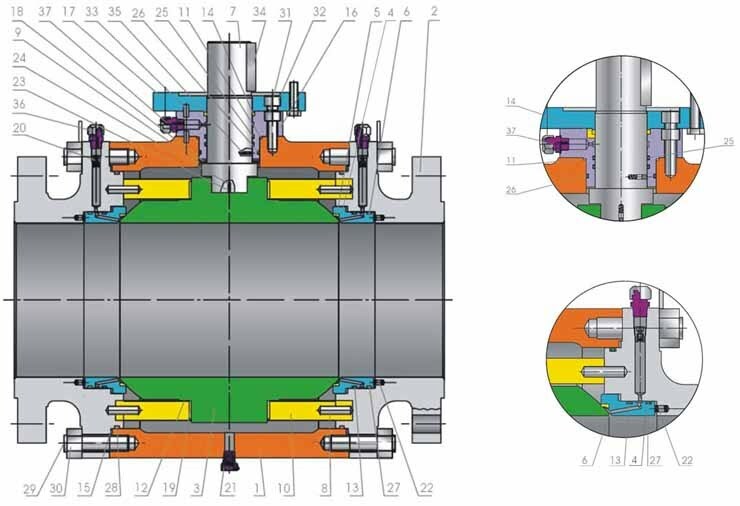 Valve is designed in accordance with the requirements of API 6D for pipeline service. Anti-static and anti blow-out stem design. Seat design gives perfect tighness and is available as either self-relieving type or double piston effect type. Disign minimizes friction leading to low operating torque. Available as double block and bleed execution,which allows for venting and draining of ling fluid from the body cavity. Avaiable Full and Reduced bore. Ball valves firesafe tested according to BS EN 12266-2,API 6FA and API 607. Electric,pneumatic and hydravlic actuators are available on customer's requirement. 21 Drain S.S. S.S. S.S. S.S.
23 Grounding Spring S.S. S.S. S.S. S.S.
35 Spring Pin C.S. C.S. C.S. C.S. 3.For over 24",flanges are according to ASME B16.47 Series A.